I can only assume Hogan's is somewhat of a Spokane institution. I say “assume” as it has been around for as long as I can remember and it always looks crowded. Yet I've never heard anyone actually talk about the spot. That's usually a bad sign. So let's begin at the end -- Hogan's is downright awful. Horrible. I can only assume people go there for the Back to the Future-esque interiors, in the same sense they visit Applebee's for its “fun” ambiance. I mean, that has to be it. No way would anyone go there for the food. 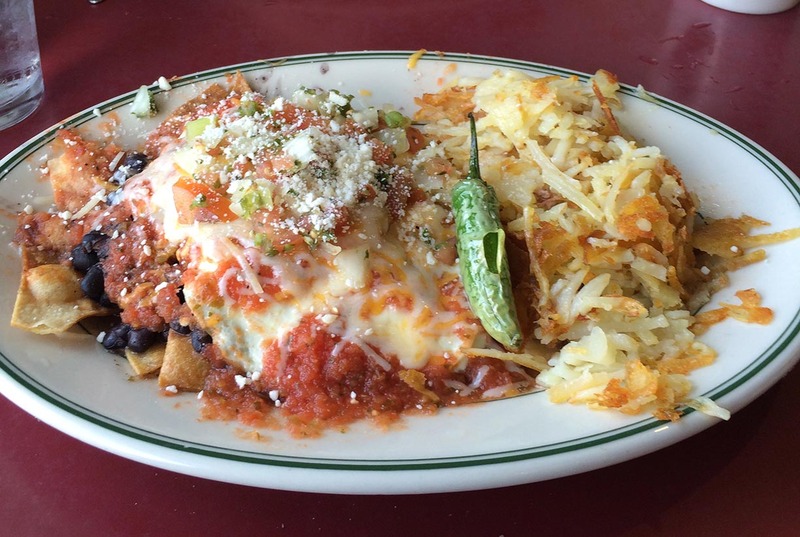 The huevos rancheros is a good example of what to expect. Even now I'm still unsure what the thought behind this dish actually was, but I'm guessing they went fusion, mixing nachos and lasagna into one unholy creature dubbed “huevos rancheros”. Yes. Lasagna and nachos. I kid you not. “What does this monstrosity look like?” you might ask. In all its glory you get tortilla chips; black beans; I assume there was an egg in there; something that might have been salsa, but tasted more like marinara; and a pound of cheese which I'm fairly sure was mozzarella. Again: lasagna meets nachos. Are any of the aforementioned ingredients even found in a traditional-ish huevos rancheros? The egg and the black beans, I suppose, but marinara and mozzarella? That is coloring a bit too far outside the lines. Yet, even with all of those oddities, I could have forgiven everything (or at least somethings) had the dish actually had any sort of flavor. It didn't. The whole thing was as flavorful as anything I can remember eating, sans possibly a childhood attempt at chewing cardboard. In short, this was the worst meal I have had in years. I could, of course, go on to the eggs benedict -- sauce from a package and all -- but what's the point? It was just awful. Grotesque. Yet Hogan's Diner will continue to thrive, right there up next to Trader Joe's. That's fine. It apparently has its place. We, however, will not be back. Not with the gourmet wonders of McDonald's shining a bright light right next door. Vote for Hogan's Diner: It’s your civic duty!